What are you giving up for Lent? Typical answers include our treats – chocolate, donuts, chocolate donuts, or if you are truly daring, sugar. Next come our habits – TV (sorry Stephen Colbert and Desperate Housewives), Ipad (no new apps for Lent), multi-tasking (hang on a second, I have a text) or swearing (O crap!). A few brave souls even rid themselves of sublime inner attitudes – ingratitude, fear of failure, a judgmental or critical heart – but I think they may just be showing off. What is the point? Does God want us to suffer just a bit, because it is good for us and builds character? I can’t buy that because enough suffering will come to each of us naturally. We need not invite more of it to prove something to ourselves or God. The point could be giving up something for 40 days prepares us for real temptations. If we can handle chocolate then perhaps we are prepared for greed, sloth, pride, lust, envy, gluttony and wrath, the Seven Deadly Sins. (Imagine talk radio hosts giving up wrath for Lent!) Or the point could be an act of solidarity. By giving up a daily pleasure, we are reminded that many people in our world do not have it at all. Basic sanitation, clean drinking water and a living wage are beyond most of the world today. Live simply so that others may simply live. The carbon fast reminds us that we live on this planet, we share it together, and unless we curb our carbon fuel consumption, we are going to foul our earthly home beyond repair. Whatever we give up for Lent, it reminds us of our dependency on certain things, our comforts, habits, addictions and securities we use to sooth, to block our anxieties. Where is God in this effort? Is there more than self-improvement involved in this Lenten discipline? How will we be closer to God at the end of Lent? If this is a practice to join Jesus in the wilderness for 40 days, then we need to know what he was doing without chocolate or indoor plumbing in this wilderness survivor reality show. This is my Son. Imagine God saying, “You are my beloved daughter, Sue, and in you I am well pleased. You are my beloved son, John and I am so pleased. You are my beloved (insert your name here) and I am pleased with you. Close your eyes for a moment and hear God say that to you. What does that feel like? For me it brings tears of joy to my eyes. I feel relief, a weight is lifted. Thank God I am beloved. How many of you feel like running to the wilderness for a month of survival camping and discernment? Why was that the next step for Jesus? After being ordained by John the Baptist, shouldn’t he be applying to a tall steeple church with some nice stained glass? Or signing a TV contract and renting a private jet to launch his ministry? Why must he test himself for 40 days fasting in the wilderness? If you want to understand the test, talk to the test maker. Then we will know what the devil is going on. Speaking of the devil, he gets a nice cameo here. Satan is often seen as the embodiment of evil, the terrifying figure in The Omen or The Exorcist or whatever the latest horror movie is. In the Bible, Satan does not do horror movies-its too obvious. In Genesis, he is the snake that says to Adam and Eve, “What’s up with that tree?” 2The woman repeats the creed she knows, “We may eat of the fruit of the trees in the garden; 3but God said, ‘You shall not eat of the fruit of the tree that is in the middle of the garden, nor shall you touch it, or you shall die.’ “Die? No! No! Your life will begin when you eat it, because then you can be your own God. God is just the opiate of the masses. But you are better than that.” (Don’t blame Eve for what happens next. Adam is right there and does not say a word. He just wants dinner, poor slub.) Satan is not the Prince of Darkness, he is the Perveyor of Deception, the Master of the Half Truth. Think political consultant: “Truth! Justice! Let’s just get the job done and we will worry about the rest when we get in office. And will someone please cut down that tree, its blocking my view. It will make me a nice deck. Tell me Jesus isn’t falling for this nonsense. Satan’s plan is brilliant. He goes right at the heart of Jesus’s strength, by challenging the very experience Jesus has just had at his baptism. The first two temptations begin with the preamble, “If you are the Son of God…” Just brilliant. Satan never challenges Jesus directly by saying “You are not the Son of God.” It’s the old “if-then” trap. If you are the son of God you ought to be changing bread into stone and jumping off roofs. If you can’t do that, then who exactly are you? What might it mean to a Galilean carpenter far from the power of Rome or Jerusalem to be called “Son of God”? Jesus is in the wilderness for 40 days trying to figure that out. He wants to know who he is and who Satan is ready to give him a little help, just a little advice. Jesus discovers his voice here in this dialog with a campaign consultant. Each answer Jesus gives is from a brief section in Deuteronomy, where Moses is speaking to the freed slaves of Israel in the wilderness of Sinai and presenting them with the laws of God. In Deut. 6 Moses has gathered the people together and gives a great State of the Union address, saying, “God has brought you out of slavery for a reason, to be a new people free from oppression. Here is how God wants it. You shall love the Lord your God with all your heart, with all your soul and with all your might.” Jesus lifts every answer to Satan straight from Moses’s best State of the Union speech. Satan tells Jesus to turn stone into bread and make himself well fed and prosperous, plenty of manna. Jesus answer from Deut. 8:13 from the section that begins with the subtitle “A Warning Not to Forget God in Prosperity.” We do not live by bread alone, but from every word from the mouth of God. It is Lent, our time to challenge ourselves and ask the right questions. What is the state of your union? How are you living out loving God with all your heart, soul and might? Is this community resembling the Beloved Community? These are tough questions, but take courage in this wilderness time. 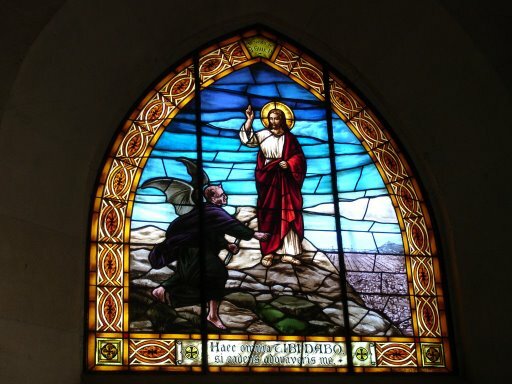 Jesus faced down the temptations so that you also may know that you are Beloved by God, that you are welcomed into the Beloved Community, and called to share this with the world.